I’m visiting an old stomping ground this week – Annapolis, Maryland. Occasionally referred to by the locals as ‘Naptown. Annapolis is the county seat of Anne Arundel County, the state capital – and at one point in history was the capital of the United States. 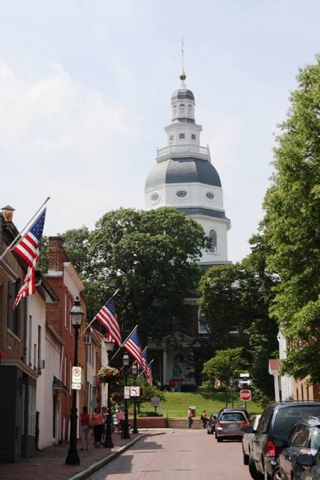 The state house in downtown Annapolis is the oldest capital in continuous legislative use. It is also the largest wooden dome in the country constructed without the use of nails. It’s worth a visit to see this iconic building; it dominates the landscape throughout downtown Annapolis. Annapolis is also known as the sailing capital of the country. Depending on when you visit – there may be hundreds upon hundreds of sailboats in the Chesapeake Bay, College Creek, Severn River, etc. There is also an annual sailboat show, as well as a powerboat show (separate weeks) that is absolutely massive. If you like greasy spoon diners – this is your place. 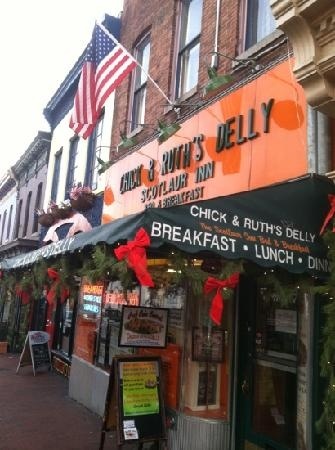 It is located on Main Street in Annapolis, and depending on time of day is generally always packed. You will see locals, midshipmen, and tourists alike. Almost all of the food is named for local celebrities, politicians, and military personnel. The food is very good, just be patient with the service as it is a very small establishment with a huge following. I would give a recommendation as to what I think is good, but I think it’s all good! One thing that is not to be missed if you’re visiting Annapolis are the Chesapeake Blue Crabs. While they are the same crabs you can get in Virginia, Marylander’s do it a little differently. As a kid growing up, we would go crabbing and bring our catch home to be seasoned, steamed and served on brown paper. As an adult, I still enjoy it – but I’m less patient when it comes to crabbing. 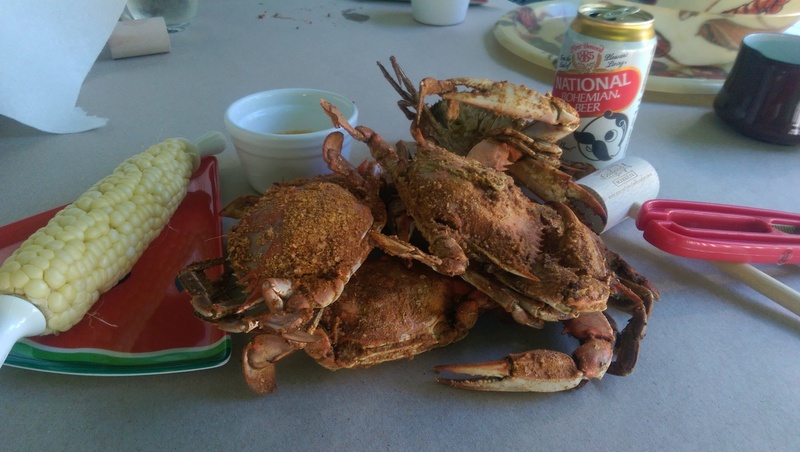 Either way – you should find a crab feast when you’re in Annapolis. My mother and I went to our usual staple the other day, the Annapolis Seafood Market (http://annapolisseafoodmarket.com/) and picked up a dozen mediums, steamed and seasoned – and ready to eat. Then we spread out the paper on the table in the backyard, and went to town. It’s moments like this that you know why Maryland is referred to as the land of pleasant living. 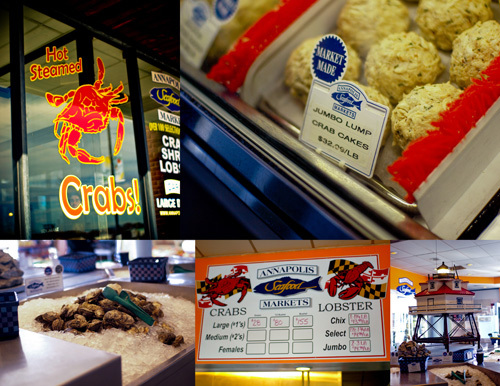 Annapolis Seafood Market is a great place to get fresh seafood, and they have just about everything you can imagine available. Ahhh, welcome to the land of pleasant living! If you’re not interested in the “DIY” method of enjoying crabs, there are plenty of restaurants in the area that will roll out the brown paper for you – and provide you with as much crab as you’re willing to eat. Harris Crab House (http://www.harriscrabhouse.com/) requires a 15 minute (or so, depending on traffic) drive and a toll but it’s well worth it. It’s right by where the watermen come in and bring their catch, so it’s very fresh and the bonus is – weekdays they have an all you can eat crab special! Another great place that is tough to find (use your GPS) that started out as a “local’s only” place is Cantler’s Riverside Inn (http://www.cantlers.com/). The wait is worse than it once was (more than just locals know about it now), but it is still worth it. Annapolis is a great place to visit as a day trip from DC. If you’re staying here, there are also tons of day trips you can take from Annapolis. If you’d like to visit, or are planning on visiting – drop me a line! I’m happy to tell you all about Annapolis and other great places to go!